Now you know we love us the Hotel Transylvania movies but did you know that the latest installment, Hotel Transylvania 3, came out on digital at the end of September and the DVD/Blu-Ray comes out tomorrow? Keep reading to find out how to win your own copy. You’re not going to want to miss this one. Did you see it yet? If not, make sure to check out my review. We’re hosting a Monster Boogie party later this month and JustaBXgirl already told me that she plans on being a mummy because she likes the mummy from #HT3 and thinks a lot of her friends will want to be vampires. If you’re looking to bring home the fun, enter below. We will be choosing our winner on Monday, October 15th because we want you to have time to check into Hotel Transylvania before you miss all the spooky fun they have happening in Hotel Transylvania 3. 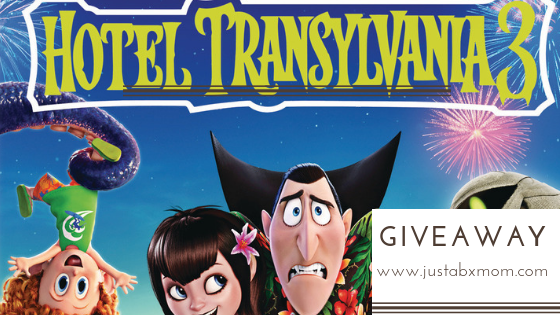 We love the Hotel Transylvania Series! My nieces would choose Winnie to be at the party. Winnie is one of my favorites! I would be Mavis. She is young and cool. I would choose to be Blobby because he is funny and everyone likes him. My family loves this series of movies. My son would choose to be Drac. My son would be Dracula. They love Drac and Dennis! Awwww we haven’t seen this yet so Riah would be so happy! Riah wants to be a darn princess. Again. As if she’s not a princess every other day. Lol I’ll try to get her to dress up like vampirinia so I can be the mom this year. But we’ll see. Lol Hope we win! Good luck, she will definitely enjoy this. Tell her everyone knows she’s a princess everyday. He would choose Dracula because he loves him! My grandson would want to be Drac. I like the little werewolves they are so adorable! They remind me of my kids. The kids love Drac the most. Oh I have to say Mavis for sure!!! My niece would love to be Mavis! My daughter loves Drac. She constantly goes around saying Blah blah blah. My son would like to be Dracula. My daughter said she would pick Mavis. My son said he would want Drac.